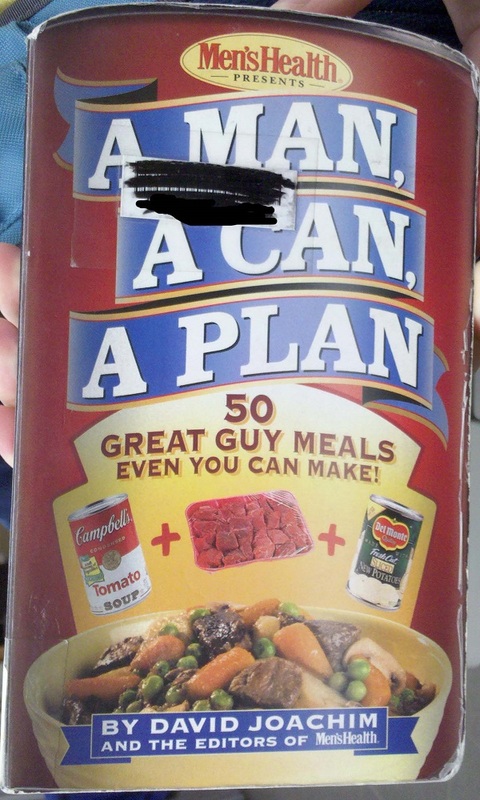 We haven’t featured an old cookbook in a while so I was glad I found this little gem in my library travels. I think the idea that a salad could be “correct” or “not correct” was a bit interesting. I found out from the chef inside that hostesses need to match the proper salad to the proper occasion. (By the way, the chef doesn’t seem to have a name, but he looks like Snidely Whiplash.) 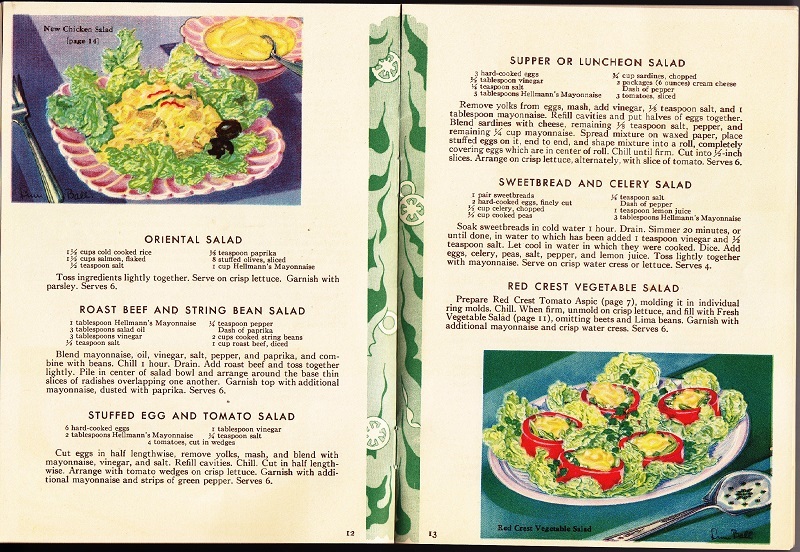 Unlike some of our other cookbooks, these are illustrated with drawings rather than photographs and the dishes don’t look nearly as awful as black and white photos might be. 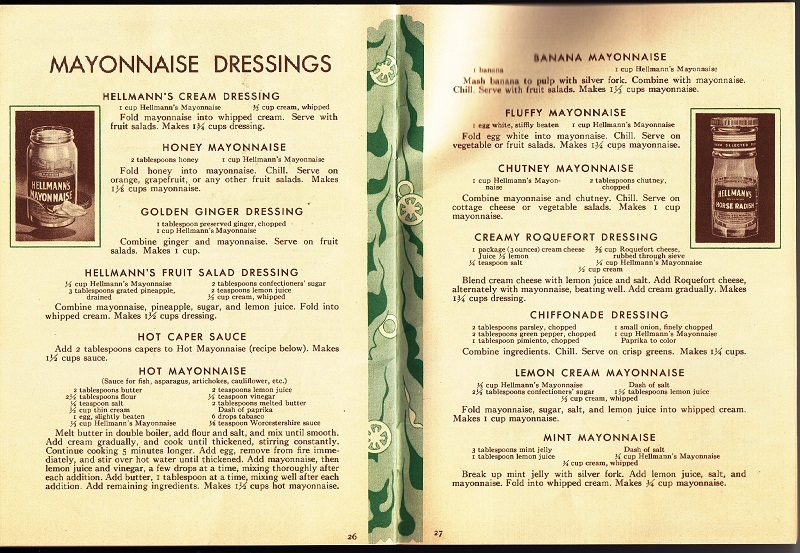 You’re not eating unless you got your banana mayonnaise…. I wonder why silver — what would have been an alternative, perhaps something that reacted with the banana and turned it brown? I misread “mode” as “mold.” Given some of the previous cookbooks, this seems like a reasonable mistake. Uh, yes, I completely agree! Perhaps to the Smithsonian American History museum??? It looks like the Smithsonian has a copy. Or in an advertising museum. It was created by the mayonnaise company, after all. 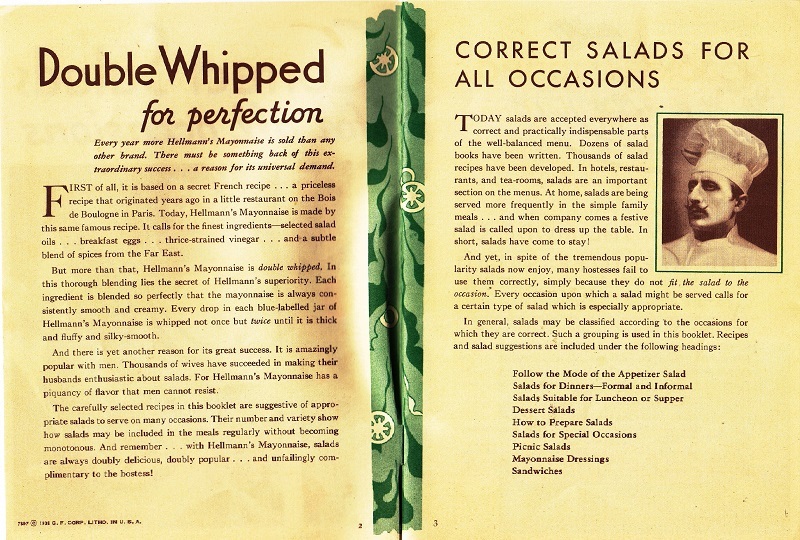 Hey, I wonder if there’s any tips in that book for dressing a salad with mayonnaise? As Charlie Brown would say, “My anxieties have anxieties!” Serving incorrect salads + social media = perfect storm. What a strange idea for what “Oriental” salad is. Apparently adding rice makes it “Oriental.” Rice, salmon, olives and paprika…sounds just like an Asian dish. Then there’s that sweetbread and celery salad! I can’t think of anything nastier than mayonnaise (which I only like with canned tuna or for dipping artichokes) with sweetbreads! Come to think of it, I haven’t even seen sweetbreads in the grocery stores in decades. Paprika makes me think Hungarian. Unfortunately there is so little sample material that I can’t make it out from the Identifont website. You would have to show it to a really good graphic designer or font founder. Frankly, I am having a problem with the grapefruit and shrimp salad. I fail to see how that could be correct for any situation! 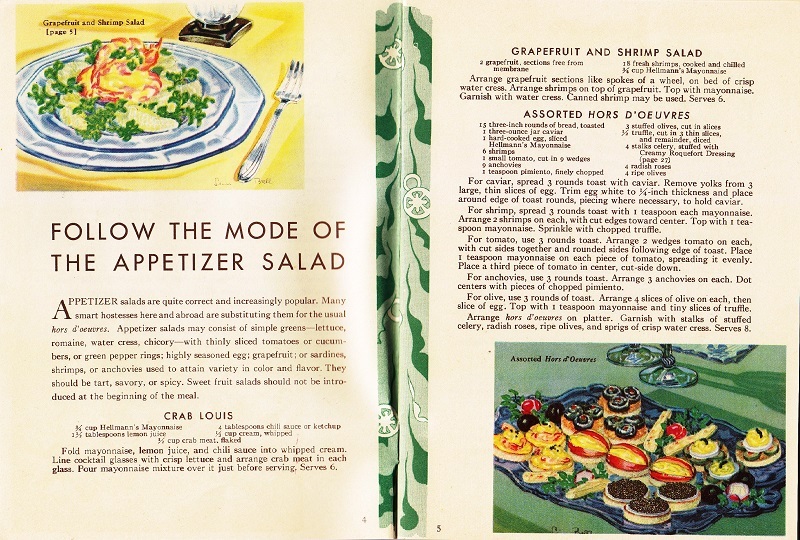 I have actually had grapefruit-shrimp salad, possibly at my grandmother’s house. It was not bad, actually. 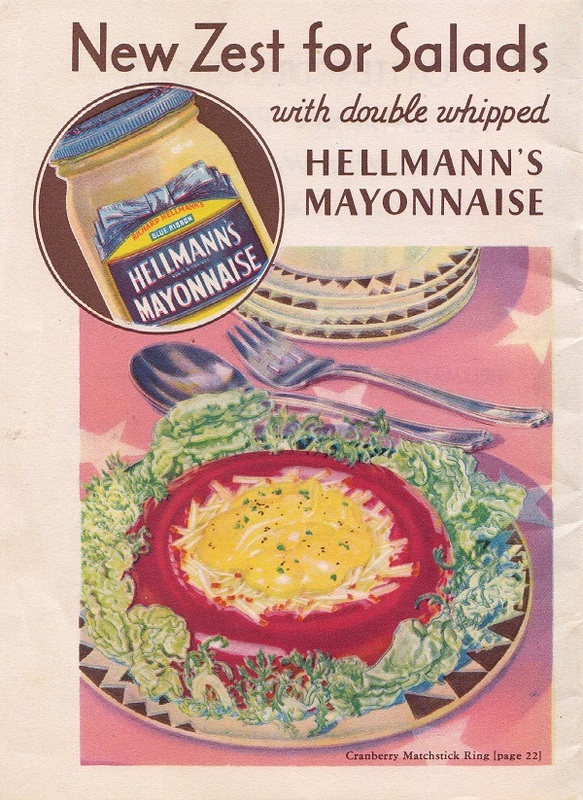 Obviously a promo item for Hellman’s mayo. I’m sure now that my serving of incorrect salads have ruined my friendships. The fact that I’m a zombie and tried to eat their brains has nothing to do with the ruined friendships. I confess that I kind of love these types of cookbooks and if I find one for a non-ridiculous price at an antique shop or used-book store, I buy them. Part of it is for the bizarre old recipes, part of it is just for the feeling of having something that seems to have come from a vanished world. 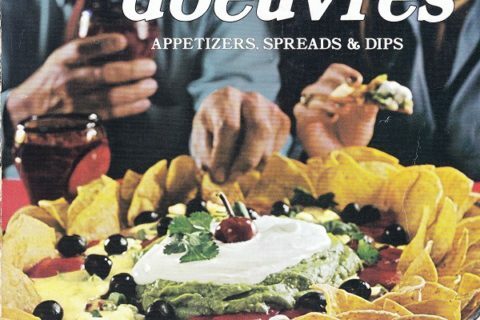 There’s a theory that back in the 50’s and 60’s they were trying to get people used to eating food full of chemicals and junk because that’s all they’d have to eat in the bomb shelters in the event of nuclear holocaust. It seems to be that way again now, except instead of chemicals they want us eating bugs and insects in everyday foods. In either case I’d be running towards the mushroom clouds instead of away from them. On one hand I really want this just for the Roquefort dressing recipe, though I’d probably leave out the lemon juice as I despise citrus. (Love both Roquefort and blue cheese dresses.) On the other I only like salads that contain said dressings, lettuce and/or spinach, and croutons. Maybe shredded cheddar cheese, grilled or fried chicken, black beans, or tofu, if available. I’m sure my salads would always be inappropriate. I bet those finicky references insisting on using a silver fork have something to do with causing or avoiding a chemical reaction between the acid in the mayo and the metallic content of the fork. There are also recipes which insist that egg whites have to be whipped in a copper bowl for the same reason (although cream of tartar causes the same effect). 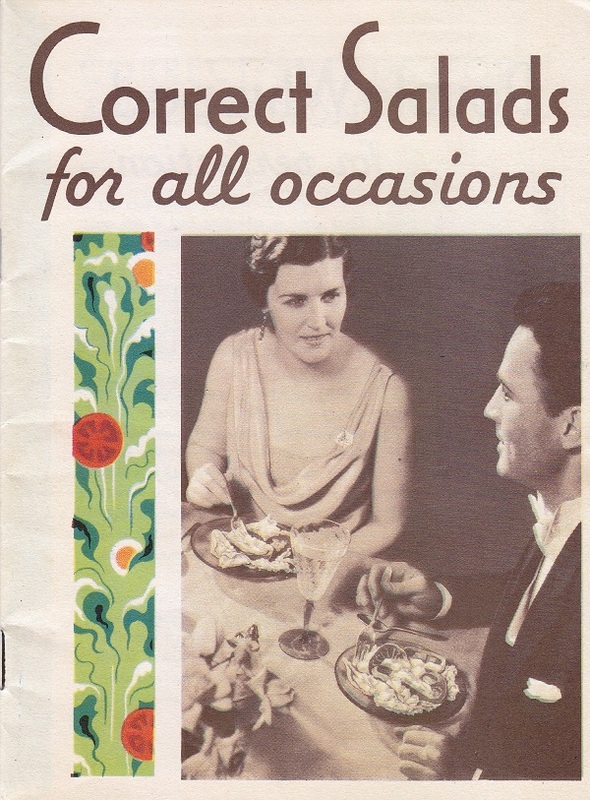 I long for the day to return when the biggest concern about “correctness” was a salad. Hate to say it but I don’t think those days ever existed. In 1931 there was still stuff like political correctness, even though the term wasn’t coined until later. Stainless stain was invented in 1913, but maybe not widely available as cutlery or widely accepted in 1931? According to this article: http://www.theguardian.com/technology/2015/apr/29/stainless-steel-cutlery-gold-silver-copper-aluminium, gold would be the most inert metal to work with, silver (and presumably silverplate) next most inert and much more widely available than gold utensils, with other metals such as copper, tin and aluminum being far more reactive with many types of foods. 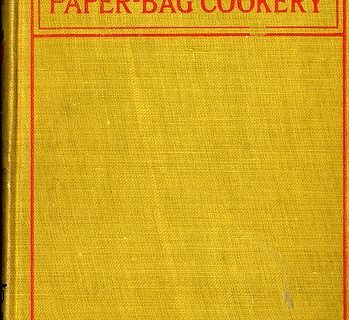 I <3 old cookbooks, and the odder, the better.